Many of us are doing our best to eat local Ontario produce, but one of the major difficulties in the Canadian climate is how to continue this throughout the year. 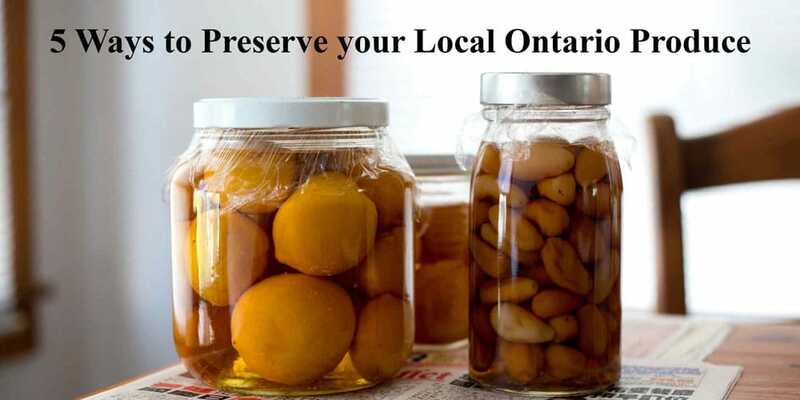 Whether you’re buying your fruits and vegetables from farmers markets in Ontario or you’re growing your own, preserving the nutrient-rich produce is a concern. Try your hand at food preserving this year, and read on to find out our top five ways to preserve your food. The easiest way to store you local produce is by fresh storage. All that this straightforward option requires is a cool, dark space such as a root cellar, basement or garage. Produce such as onions, garlic, root vegetables and apples last a long time in conditions like this. Using your fridge is a similar storage option to fresh storage, but the temperature and moisture levels are lowered. Food items like carrots and beets do very well in this manner of storage. You can place them into large freezer bags and eat them as you need. Freezing your local produce is a great option that will preserve the closest flavour and texture to fresh. If you are planning on using this option often, it is recommended that you use a chest freezer because it doesn’t have the usual defrost cycle of a kitchen freezer. Some vegetables will require you to blanched or steamed first to stop the enzyme action (which will cause loss of flavour, colour and nutrients), but others can be stored raw. Foods such as peppers and kale store great in freezer bags or containers. This is a little more of an involved storage option, but one that can help foods last for over a year in fridge storage. Fermented foods retain a lot of their nutrients in storage, more than canned foods, and has the added benefit of bacteria that is excellent for your gut health. Pickling options that work the best are cabbage, onions, carrots, eggs, and cucumbers. The final, but most complex storage option is canning. Using a large stockpot with a lid you’ll cover your jars with water to sterilize them. You can use this method to preserve your fermented foods longer, as well as jams and jellies, or tomatoes. You can use a pressure canner for lower acid foods such as carrots, beans, sauces, broths and soups but you will need to purchase one specifically for this. Keeping your fresh foods as delicious as the day you brought them doesn’t have to be a difficult as you might think. Choosing which storage option appeals to you most can make this process easier and thus more likely for you to continue. Being able to eat your home grown foods in the depths of winter will be a satisfying reward for your hard work. We’re looking forward to seeing you back on the farm in the spring.